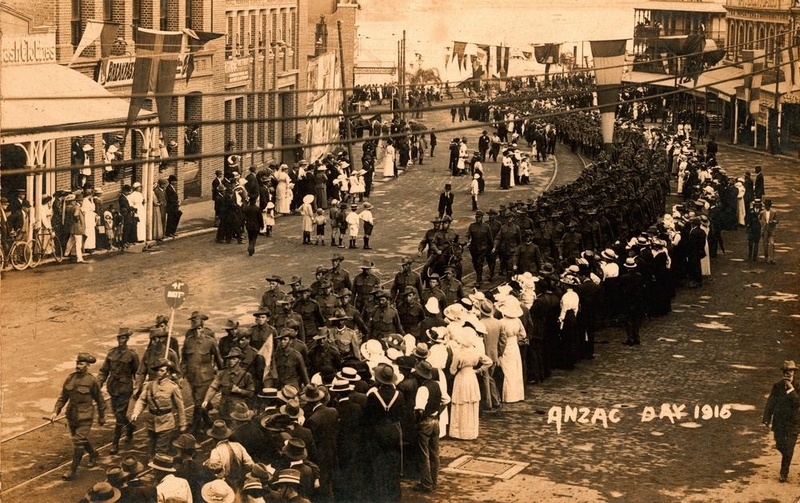 Description: Men, women and children line the streets to watch the procession of the 41st Battalion through Brisbane on Anzac Day, 1916. The street is decorated with flags, strung between buildings on either side of the road. Bells Paddock, 41st Battalion. A Company. My Dear Brother, Just a post card to let you know I am well. We are leaving on the eighth of the month for lord only knows where. We have not had any drill yet, so it will be a few months before we see the firing line. Charley Williams is down here in camp. I will send a photo of myself before I go. This postcard of our battalion leading on Anzac Day, six thousand marching. There is a lot of Mackay lads in the hut. I ...(?) will now conclude, hoping this will find you well, as it leaves me. I remain, your affectionate brother, Earl.